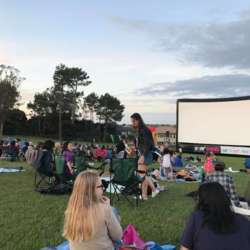 During summer in Auckland, locals know there are free movies in parks provided by various council boards which are a perfect opportunity to have a picnic with friends before settling down for a post sunset movie you haven't seen. This one is the latest Jurassic World: Fallen Kingdom with Chris Prat, Bryce Dallas Howard and Jeff Goldblum. The plan is to meet a couple of hours before the movie (6PM), have a picnic where you can meet and chat with fellow InterNations people before we settle down for a the movie start which will be around 8.20. There will also be pre-movie entertainment from 6.20pm. If you don't want to bring a picnic, there are usually food trucks and traders offering various drinks options. It's recommended to bring a blanket, a torch (although your phone can work), maybe some pillows. Folding camping chairs are great for the picnic phase of the evening but you won't be too popular when the movie starts with the people behind you! Also after dark the temperature can drop a bit so a jumper, fleece and other warm clothing is a good idea to bring. b) get a good spot to watch the movie and relax! c) a chance to meet your fellow interNations people!